Luminescence has launched an integrated campaign marketing a pioneering new senior leadership programme for the prestigious Møller Executive Education, part of Churchill College, Cambridge. 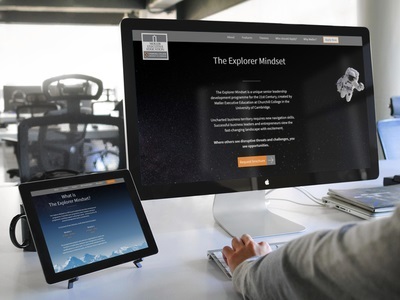 The Explorer Mindset is a unique executive education programme, designed to prepare senior management for the extreme and complex business environment that the World Economic Forum calls ‘the fourth industrial revolution’. The full-board residential programme aims to equip senior management, C-suite, entrepreneurs, and partners – especially those at an inflection point – with the cognitive, emotional and behavioural resources (or ‘mindset’) to confidently lead their organisations at this critical point in history. The Explorer Mindset programme is split into two Modules: Module 1 takes place from 26 Nov – 30 Nov 2017 and Module 2 from 29 April – 2 May 2018. The programme is structured to fit around management work commitments and provides a pre-programme personalised diagnostic, and inter-modular and post-programme coaching support and project work. The price is £8,000+VAT including all tuition and for full-board residential during both modules. Cambridge-based Luminescence is project managing the integrated campaign for an international target audience. Using the PESO model of Paid, Earned, Shared and Owned media channels, Luminescence has developed a highly targeted marketing communications strategy for Møller Executive Education. 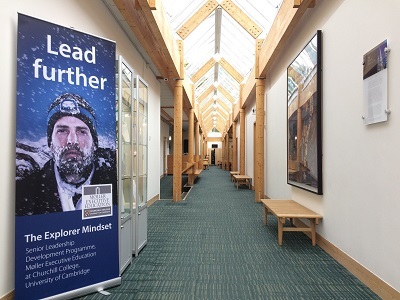 Developing on the explorer metaphor, the campaign seeks to show a diverse array of leadership ‘heroes’ leading ‘further’, ‘deeper’ and ‘higher’ in uncharted territory, mirroring that of the highly complex, competitive and unpredictable business environment that has emerged in the 21st Century. “The media, marketing and PR sectors themselves are on the bleeding edge of digital disruption, the rise of socially-created information and the sea-change initiated by the millennial demographic; all themes inter-woven in this senior leadership programme.